The annual sports blogging conference "Blogs with Balls" was held in Chicago on Wednesday, featuring a well-timed panel discussion, "Treatment of Women in Sports Media." The panel tackled the subject of online harassment one day after the podcast "Just Not Sports" released a four-minute PSA on the same topic. It featured espnW's Sarah Spain and fellow Chicago sports personality Julie DiCaro, who were on Wednesday's five-member panel of women sports journalists. The discussion touched on how the lack of diversity within the industry has helped perpetuate stereotypes about women in sports, and what the possible solutions might be. Here are six eye-opening things I heard at the panel, and my takeaways from them. While not knocking the progress that's been made, Hendricks acknowledged that female representation among key decision makers is lacking. The hope is, as more women are appointed to high-profile and public-facing positions, societal perceptions of women -- and the way they're discussed -- will evolve. Too often men are dominating the conversation about women-related issues because women do not occupy the spaces where the discussions are being had. The rate at which this is the norm is alarming and quite frankly, nonsensical. When women share stories of online harassment, they can be met with more of the same, including outright dismissal of their experience. 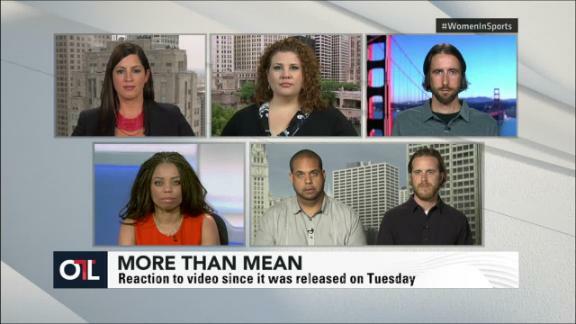 But the #MoreThanMean PSA yielded mostly supportive and empathetic reactions from men. How much of that had to do with the fact that men were reading the messages? Women in social media have found strength in supporting and empowering each other, including proactively blocking anyone who has harassed a peer. It's a move that exhibits solidarity and reduces their chances of becoming future targets, and it has produced a powerful sisterhood and strong community inclusive of male allies. When men direct sexually-charged remarks toward women online, it's a reflection of our culture, and the general over-sexualization of women that exists. The threats aim to dehumanize women, and men must be aware that online abuse and threats are not harmless. They're dangerous violations for which they must be held accountable. Women censoring themselves is not an option. Despite the exhaustion of fighting online harassment, it's so important that women remain resilient by continuing to publicly express themselves and pressuring social-media companies to protect them against the hate.